Creating a data-first culture. Choosing the right marketing technology. Using AI for segmentation, personalization, and optimization. These are just a few of the challenges being addressed at The MarTech Conference. Check out all 27 presentation topics below and get your free Expo+ pass today. Bonus! You’ll also get a Session Sampler pass to attend your choice of one main conference session or keynote*. See the complete agenda. Have any questions? Shoot our team an email at registration@martechconf.com. *Sorry, mealtime presentations are not included. 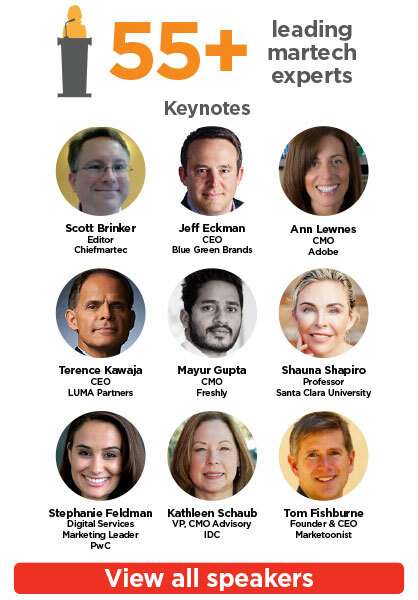 A couple weeks back I previewed the graduate-level keynotes and sessions coming to MarTech, plus seven other awesome reasons to join us April 3-5 in San Jose. When it comes to MarTech attendees, 68% plan to implement a new technology solution in the next year. But what are best practices for evaluating technologies, choosing vendors, and getting your colleagues on board? Tony Byrne will answer those questions and more in this in-depth workshop. Learn more. Most marketers, if you really push them, admit that their data is a mess. If you’re one of them, join David Raab for a comprehensive dive into customer data platforms: what are they, why you need one, choosing the right solution, and preparing the business case for adoption. Learn more. Workshop Presenter: David Raab, founder of the Customer Data Platform Institute, Principal at Raab Associates Inc. The pace of marketing is accelerating. And marketing teams need to keep pace. This workshop will show you how to do just that! Marketing pioneer Andrea Fryrear will show you how adopting “agile” and “lean” methods will lead to better marketing results. Learn more. Creating Connected Experiences – Sold out! Stop acquiring more marketing technology and start better connecting it to your digital customer experiences. This event will help you realize the full potential of your existing martech investment by better aligning it to your customer experience strategy and digital execution. Learn practical frameworks and models to find and fix the cracks in your digital customer experience and better connect your marketing technology to support the customer journey. Learn more. Great marketing results start with a great marketing team. How do you know that the team you have in place is capable of achieving optimal results? Attend this workshop to learn a Talent Design & Optimization framework so you can strategically design your team, align team members to your culture and goals, hire purposefully, and manage the team smartly as your business grows. Learn more. This is your chance to learn from the pros in an intimate, hands-on environment. Don’t miss out! All Access Pass + Workshop (best value! ): You’ll unlock the complete MarTech experience, including all sessions, keynotes, networking, and amenities, plus your choice of half-day intensive workshop. Register by April 2 to save $300 off on-site rates! Workshop Only: Interested in just a workshop? Register by April 2 to save $150 off on-site rates. Add a free Expo+ pass to your itinerary and unlock the entire Expo Hall, including 100+ solution providers, full-length sessions on the Solutions Track, demos and case studies in the Discover MarTech Theater, evening networking events, plus one conference session or keynote of your choice! These workshops sell out every year – so act fast to secure your seat. See you in San Jose! Psst… Have you heard about our special group rates? Attend MarTech with your team for a unique team-building experience AND enjoy special discounts when you register. Save up to $600 off to on-site rates when you book your MarTech pass by March 2! You may know Tom Fishburne, a.k.a. the Marketoonist, who keeps us in stitches with his humorous takes on serious marketing, customer experience, and technology issues. Tom will once again be keynoting at The MarTech® Conference in San Jose April 3-5. I’m really looking forward to his new presentation, Look! Squirrel! Beyond the Shiny New Thing to Sustained Organizational Change. Tom will enlighten us as he makes us laugh at the way we think about adopting new martech, overcoming fear, and driving transformation at our companies. Keeping with tradition, here’s your opportunity to be recognized for your own sense of humor and participate in the MarTech Cartoon Caption Contest. In 2017, we received more than 150 silly, inspiring and nutty entries, and this year we’re hoping to really get the creativity flowing. Submit your creative caption for the above cartoon by Thursday, March 14 by 11:59 pm PST. Tom will share the best entries in San Jose on Friday, April 5 as he unveils the official version of his cartoon during MarTech’s closing presentation. If you win, you’ll get an on-stage shout out and receive a framed version of the cartoon with your caption, autographed by Tom. Twice a year, I face a dilemma. Presented with hundreds of nominated speakers and topics for an upcoming MarTech® conference, I have to choose only a few dozen to fit into a two-day, three-track event. It’s a dilemma for a couple of reasons. First, the vast majority of pitches we get from martech practitioners and experts are really good. Having to turn down most of them, simply due to the limits of time and space, kills me. I’m so grateful to everyone who sends in proposals, and I’m sorry we can’t accommodate you all. Believe me, I wish we could. But there’s a bigger challenge: how can I best serve you as a MarTech attendee? Martech is such an expansive and diverse field that it’s impossible to cover all of it. Especially because we don’t think of martech as merely a collection of tools and technologies. That is massive enough on its own. But we think of martech more holistically as a new discipline, the innovation of marketing, technology, and management combined. That’s a pretty wide lens. So out of all the possible topics and case studies we could cover, how do we select only a subset of them to make MarTech most valuable to you? Do we go broad and scan everything at a 50,000-foot level? Or do we pick one or two concepts and dive deep on them? Focus on B2B or B2C? Program for senior executives or hands-on marketing operations managers? Those starting digital transformation or those far along the journey? Big enterprises or small start-ups? That’s a lot of either/or divisions. The easiest thing to do, from a conference positioning point of view, would be to narrow down to a specific martech category and a specific audience segment. In fact, there are a ton of great conferences that do just that. For instance, Third Door Media, the producers of MarTech, also run the SMX Advanced show that’s focused on expert-level techniques for SEO and paid search marketing. But I think there’s a powerful need for something different. I’ve come to believe that two of the biggest barriers to growth in a rapidly changing marketing environment are siloed specialization and false dichotomies. Specialization is good, but comes with an increased risk of tunnel vision. You can pay so much attention to what’s happening in one narrow slice of marketing, studying only strategies and tactics that are analogous to yours, that you miss disruptions coming at you from completely different angles. The truth is that the biggest challenge in modern marketing isn’t mastering search engine optimization, analytics, personalization, or any one tactic. The hard challenge is connecting all of those pieces together into a cohesive whole. It’s seeing the forest for the trees. False dichotomies can be just as blinding. Centralize or decentralize. Automate or humanize. Suite or best-of-breed. Software or services. Build or buy. I’ve railed against these either/or choices in numerous articles on the new rules of marketing technology and operations, the compatibility of strategy and agile marketing, the simultaneous expansion and consolidation of martech, and the three trends driving the Second Golden Age of Martech. Because most of the time, these black-or-white, either/or choices are wrong. They’re called false dichotomies — false choices — because, well, they’re false. It’s not only that there’s an entire spectrum of colorful possibilities between the two opposite poles, although that’s true. It’s that in many cases you can actually achieve both/and simultaneously. The two ends can be connected together to unleash incredible innovation. Agile practices that enable strategy. Explore an intentionally diverse range of martech topics — a curated tour across the entire spectrum of the field. Attendees not only learn new things. They should have unexpected discoveries. Aim for “graduate level” presentations on those topics. Better to be stretched a little beyond your comfort zone than to be bored with rudimentary notions that you’ve already heard or read about a dozen times. Program three kinds of sessions: marketing concepts and cases that leverage technology (Marketing Track), the more technical dimension of marketing operations and emerging technologies (Technology Track), and organizational and managerial approaches that help people leverage these technologies effectively (Management Track). Encourage everyone to hop among the tracks. Cross-pollinate ideas across B2B and B2C examples, executive-level viewpoints and in-the-trenches practitioner perspectives, digitally native high-tech unicorns and digitally transforming traditional businesses, enterprises and start-ups and firms of all sizes and stages in their lifecycle. Every presentation shares strands of DNA for the intersection of marketing, technology, and management. But the expression of that DNA is wildly diverse from session to session. That diversity — and the combinatorial innovation it ignites — is one of the things that makes MarTech special. The upcoming MarTech conference in the Bay Area, April 3-5, will deliver on the promise of an in-depth, vendor-agnostic, BS-free program that will help you better lead marketing technology and operations at your own company. You’ll hear first-hand accounts of martech innovation from leaders at Aetna, Autodesk, Cisco Meraki, Docker, Epsilon, Freshly, Fuze, IDC, LinkedIn, Livongo, LogMeIn, Netflix, The New York Times, Nordstrom, NPR, Plantronics, PwC, Riverbed Technology, Sub-Zero, Zendesk, Zillow, and more. I’ll open with a keynote revealing the 2019 marketing technology landscape in collaboration with Jeff Eckman of Blue Green, the latest martech salary survey results, and a framework for the evolution of marketing operations and technology heading into 2020. We’ll follow with a fireside chat with the remarkable Ann Lewnes, CMO of Adobe, discussing the balance of creative and analytics, the interplay of technology and talent, ways in which marketing organizations are evolving structurally, and the trends in the industry that inspire her most. That afternoon, we’ll have back-to-back keynotes from two martech pioneers: Mayur Gupta, the CMO of Freshly, and Terence Kawaja, the CEO of LUMA Partners. Terence will talk about the disruptive innovation of direct-to-consumer (D2C) brands, how they’re harnessing marketing technology to beat incumbent brands, and what marketers across all markets can learn from them. Mayur will share lessons from his career journey, rising from a marketing engineer to a CMO, spanning work at Sapient, Kimberly-Clark, Healthgrades, Spotify and now the D2C brand Freshly. The next morning will begin with Shauna Shapiro, a professor at Santa Clara University and a world-renowned expert on mindfulness. Co-author of the recent Harvard Business Review article How Mindfulness Can Help Engineers Solve Problems, she’ll discuss mindfulness for innovation and change management. Talk about unexpectedly connecting dots: yes, it’s martech and mindfulness. Matthew Lieberman, CMO of PwC, will present on marketing enablement and empowerment, sharing the story of how his organization underwent its own digital transformation — with an empowered marketing team leading the way. Kathleen Schaub, leader of the CMO and customer experience practices at IDC, will offer her insights into guided decentralization: safely scaling customer-facing empowerment. Tom Fishburne, the brilliant marketer-turned-cartoonist Marketoonist, will deliver the closing keynote for the conference that afternoon, with an interactive presentation of Look! Squirrel! Beyond the Shiny New Thing to Sustained Organizational Change. Aside from guaranteed laughs, Tom will help make the ideas you take back from your MarTech experience actionable. Meg Goldthwaite, CMO of NPR, will explain how voice-driven AI technologies are changing behavior – and what that means, not only for businesses and marketers, but for society as a whole — in The New Era of V-Commerce: What Marketers Need to Know about Alexa, Siri and the AI Revolution. Debbie Qaqish, Chief Strategy Officer at The Pedowitz Group, will address the challenges of Combining Marketing Operations and Sales Operations for Customer Magic. She’ll examine the pros and cons of a variety of organizational models while also learning how to best manage both old and new martech and salestech stacks and data. Which stages of the buyer journey are best suited to AI? How can you better align sales and marketing with AI? How can you best measure the impact of AI on your sales and marketing performance? Which new skills are required of your marketing team to successfully implement AI? What specific applications of AI are most successful? Adopt a people-first approach to decision-making. Use the full power of digital technology to build cognitive empathy. Habitually observe human interactions in context to feed innovation practices. Continually monitor and fine-tune the human experience. Cyndi Marty of Sub-Zero and Alexandre Pelletier of Perkuto will jointly present What’s Cookin’ in Citizen Technology: Sub-Zero’s Journey Toward Decentralized Marketing. Cyndi has been leading a year-long project to transform from a centralized marketing model to a hybrid approach that takes advantage of decentralizing campaign marketing capabilities. She’ll describe her decision to make the transition, share challenges (both technological and organizational) they overcame, and provide insights into the ROI of the transition for the company and its sales network. With devices like Amazon Alexa and Google Home’s voice-enabled options, consumers are relying more and more on browserless interactions. Now is the time to rethink how you reach and engage your customers in this emerging environment. Tricia DelGaudio, Strategy Director at Epsilon, will further explain new technology-powered strategies for Marketing in the Age of Assistants. Siara Nazir, Head of Digital Marketing at Autodesk, will dig into The Data Dimension of Digital Transformation: How Autodesk Instrumented Its Customer Journey. She’ll describe how they leveraged a CDP to unify and centralize data — and then turned the learnings from it into a better omni-channel strategy. Mike Pow, Senior Product Manager of Experimentation Platform at Netflix, will reveal in Quasi Experimentation at Netflix how they deploy experiments in which the units of randomization are not people, cookies, or members, but geographical units or time. This experiment design enables Netflix to learn about topics for which a traditional A/B test would be infeasible or impractical. The company is simultaneously building the scientific methodology and platform to maximize the learnings from each experiment, doing it at scale and company-wide. Reshaping the organization in a changing environment. Rationalizing the stack to serve new business requirements. Martech profiling for quick analysis and decision-making. The value of a single source of technology truth for training and onboarding. Best practices for mobilizing combined teams to coalesce around new technologies and stack structures. Isabelle Hierholtz, User Strategy Director at Digi-Capital, one of the world’s leading AR/VR analyst and consulting firms, will present on Marketing ROI Growth Using Mobile AR. Isabelle will show how mobile AR has been used to drive 11x sales uplifts in lifestyle ecommerce, design mobile AR first retail experiences, revolutionize the shoe buying experience, and gain additional big box retailer facings and grow sales across the US, China, and Europe. Jason Mestrits, Senior Manager Data Science & Analytics at Nordstrom, will share how leading marketing organizations are winning with a focus on data enablement, customer analytics and AI-driven innovations with Marketing Data Science and Your Data Strategy. You’ll gain insights on how creating a comprehensive data strategy enables your marketing function to do more, focus on driving meaningful competitive advantages, and avoid missed opportunities. Aaron Wroblewski, AI Software Engineering Manager at Zillow, will present a case study of Personalizing User Experiences: Beyond A/B Testing. He’ll share the business case for a system to dynamically select personalized marketing content and calls to action for each customer. Aaron will also identify potential pitfalls like user behavior changes and data and featurization issues, while also describing the tests, metrics, and solutions that helped Zillow overcome them. Jennifer Brett, Head of Americas Insights at LinkedIn, will present Measure What Matters: Data Strategy to Drive Results, explaining how to go beyond clicks and engagement metrics to more meaningful measures of success, such as lead quality and closed business. Rachel Beck, Global Manager of Marketing Ops at Cisco Meraki, will explain how they created a marketing ops function at a fast-growing company in only 12 months with Year One: Building a Marketing Ops Team From the Ground Up. How to identify roadblocks and friction in organizational structure. How current organizational structure works, why it works and how to improve and evolve.How Docker uses containers to reduce deployment times & support customized API logic. How to manage responsibilities across the stack: CRM, MA, CMS, Data Warehouse, BI tools, peripheral tools. Tony Byrne, the founder of research and advisory firm Real Story Group, will also host recurring Discover MarTech Theater presentations on The New Omni-Channel Stack, The Right Way to Buy Marketing Technology, Myths Vendors Tell, and Get the Right Vendor Short List. You’ll also be able to meet with dozens of other martech vendors exhibiting in the Expo Hall. If you’re looking to achieve the best results from marketing technology in your organization, as a marketing technologist, a marketing operations leader, a marketing executive, or the champion driving digital transformation, this is an event you won’t want to miss. Our Beta rates end on Saturday, March 2. Reserve your seat now. I’m looking forward to seeing you in April! P.S. Get a sneak peek at the kinds of insights you can expect at MarTech by joining me Thursday, February 28 at 1:00PM EST for a free webinar: 2019 Martech Trends You Need To Know. Secure your spot today! Pixalate estimates that OTT fraud will rob marketers of up to $10 billion in ad spend annually by 2020. The testing platform’s new link with the popular collaboration tool aims to bring Optimizely’s capabilities into users’ daily workflows. Marketers must examine how people-based IDs differ and how quality impacts identity through activation. Learn how to evaluate your program. What’s the hold up with using RCS to send rich media messages and host group chats across all mobile devices and networks right out of the box? Well, a lot actually. Users invoke the feature in one of several ways and it keeps going until you verbally turn it off. Brightcove CEO says the deal will immediately grow the company’s global workforce and accelerate its ability to deliver deeper support for customers. Join the godfather of martech, Scott Brinker, for a live, exclusive look at the three overarching trends shaping marketing technology today and in the future: The maturing of martech platform ecosystems. The blending of software and services. The rise of citizen engineers. The company also released new tools designed for IT and developers managing app development. IAS’s Digital Pulse Survey also found that though concern about ad fraud has dropped, it’s still at the forefront of marketers’ minds. The site is continuing to build out its performance-driven advertising options for marketers. For nearly 15 years, SMX® Advanced has been the event expert search marketers attend to learn performance-enhancing tactics, make game-changing connections, and further their careers. Join them in Seattle June 3-5. The agenda is live and ready for you to explore! Register now & save up to $900! All Access Pass: Book now and save $450.